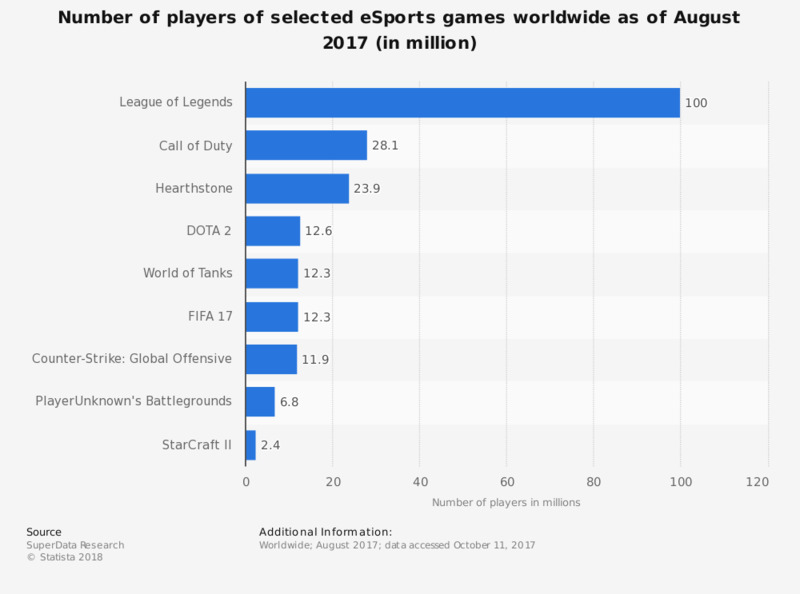 The statistic presents information on the number of players of selected eSports games worldwide as of August 2017. According to the data, League of Legends was a leader based on number of eSports players. In the presented period the game had a player base of 100 million, while World of Tanks ranked fifth with 12.3 million players in the measured period. eSports is profitable, not only for the industry as a whole, but also for individual players. As of March 2017, the highest earnings were those of an American professional gamer, Saahil Arora, better known among his peers as "UNiVeRsE". He started his adventure with eSports as part of a team Evil Geniuses in 2012 playing DOTA 2, but truly kicked-off his career as an offlaner in team Dignitas during the International 3 in 2013. Later in the year he agreed to a contract buyout settlement which allowed him to rejoin Evil Geniuses. Throughout his recorded gaming career, UNiVeRsE has earned 2.72 million U.S. dollars. Among female players, the profits are significantly smaller. To date, the highest earning woman in eSports, Sasha Hostyn from Canada, who goes by "Scarlett" in the gaming industry, has made 171 thousand U.S. dollars in the course of her eSports career. Hostyn began her professional eSports journey with StarCraft II in 2012 and her skills were awarded with nicknames such as "the queen of StarCraft II". In 2015 Scarlett started a transition to DOTA 2 but eventually in late 2016 returned to StarCraft as a member of Team Expert. Based on social media presence and engagement, it is evident that eSports players are among the celebrities of the online world. For example, in January 2016, Lee Sang-hyeok, a player from South Korea, was the leading player, by number of fans on Facebook, with 806 thousand people following his profile. This figure falls roughly somewhere between the Facebook fan base of Colorado Avalanche and San Jose Sharks NHL teams.